The calming effects of sipping a hot cup of tea on a cold day allows you to slow down and take a moment for yourself. When many of us are at risk for getting sick or feeling run down during the holidays or during the change of seasons, a daily cup of green tea can have powerful effects on both your health and mental well being. A known superfood, green tea is said to be high in antioxidants, and its low levels of caffeine are said to help improve your mood, mental clarity, and focus. But for some, the grassy taste and vegetal aroma of green tea is not appealing to their taste palette. As an alternative, we have prepared a green tea soup that has all the benefits of green tea but in a delicate vegetable broth. Simmering hojicha and mushroom broth. The flavor profile of this soup combines, garlic, ginger, shiitake mushrooms and hojicha loose leaf tea into a hearty meal that will warm your spirits. Hojicha is a roasted green tea that has an earthy aroma and a golden brown hue when brewed. We like to call this broth our “superfood soup” as its ingredients have been said to help boost the immune system with their vitamin and mineral rich content. Additional ingredients like rice wine vinegar and light soy sauce are used to help develop the umami flavor of the tea and the mushrooms, with neither one overpowering the other. Served over soba noodles, with baby bok choy and a soft-boiled egg, this fiber and protein rich soup is perfect for lunch or a light dinner on a cold day. All of the necessary ingredients. 1. To rehydrate the mushrooms, place them into a bowl and cover with hot water for approximately 20 minutes, or until soft. Strain mushrooms and rinse under cold water. Slice rehydrated mushrooms into thin strips, removing the stem. 2. Place loose leaf tea into a large heat proof bowl; pour the steaming hot water over the tea and steep, covered for 3-5 minutes. Strain into a large stock pot. Discard leaves. 3. Add sliced ginger and garlic to the tea stock, and bring to a boil. Reduce heat and simmer, covered for 20 minutes. 4. While the soup is simmering cook the eggs separately for approximately 8 minutes to ensure the yolk remains soft. Cook noodles according to package instructions, rinse with cold water and set aside. 5. When the broth is done use a slotted spoon to remove ginger and garlic from the pot. 6. Add soy sauce, rice wine vinegar, sugar, salt and pepper. Stir over medium-low heat for 1 minute. Taste and add salt if needed. 7. Add sliced mushrooms and bok choy leaves. Heat through for 2 minutes. 8. Divide noodles into 4 bowls. 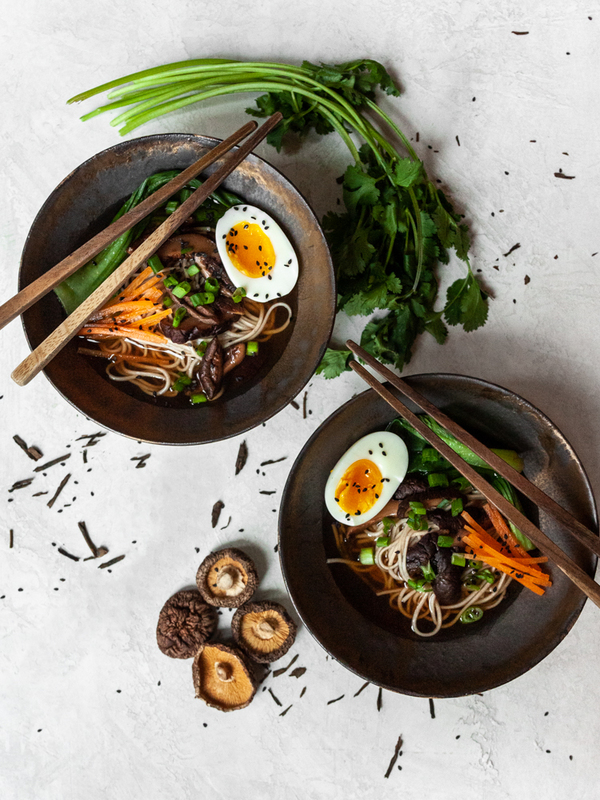 Pour hot hojicha broth with mushrooms and bok choy over each bowl and then garnish with egg, sliced carrots, and spring onion. Sprinkle with black sesame seeds, and cilantro, if using.